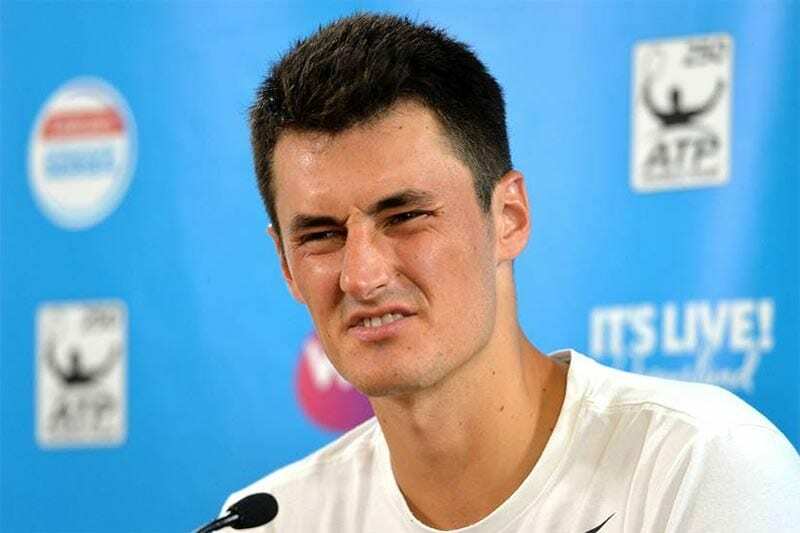 Bernard Tomic made headlines for all the wrong reasons – and not for the first time – after his meek exit from the 2017 Wimbledon Championships. Once Australia’s brightest tennis prospect, he is now persona non grata in his homeland after admitting he “couldn’t care less” about winning. It was not the first time Tomic appeared to lose interest mid-match, and there is a very good chance it will not be the last. Yet it would be naive to suggest he is only professional athlete who has shown a propensity for giving less than his level best on the field of play. How do Bernie’s pea-hearted efforts stack up against these infamous ‘white flag’ moments? If you have a contender in mind, let us know in the comments section below. What is it about Mischa Zverev that brings out the worst in Australian tennis players? Just as he benefitted from Tomic’s insipid display at Wimbledon 2017, it was the German journeyman who stood at the other end of the court when Nick Kyrgios lost the plot at the Shanghai Masters in 2016. After losing the first set and struggling early in the second, the Aussie prodigy gave up any pretence of effort as he slumped to a 3-6, 1-6 defeat. It reached a point where Kyrgios made no attempt to return the ball and gave Zverev free points with weak, amateur-style ‘waiter’ serves of his own. He was fined over $20,000 and suspended for eight weeks, yet many observers – including a number of ATP Tour stars – felt the sentence was a little lean. We could write a whole series of articles devoted to John Daly’s antics on and off the golf course. The one they call ‘Wild Thing’ has courted controversy in just about every manner imaginable since bursting onto the scene with his shock win at the 1991 US PGA Championship. He hits it big, he dresses loud, he loves a drink, a smoke and a punt, but his short temper and his myriad vices have landed him in hot water on too many occasions to count. Daly’s eccentric behaviour was never on fuller display than during the first round of the 2011 Australian Open. After copping a two-shot penalty for playing the wrong ball on the 10th hole, everything fell apart for ‘Long John’ at the 11th. He hit one in the water, then another, then another five before walking off the course with no balls left in his bag. Australian sports fans demand one thing above all else from their athletic representatives: to fight until the bitter end. That expectation proved far too steep for Sally Robbins. The Perth native was part of the Aussie team that rowed in the women’s eight final at the Athens 2004 Olympics. Still in the hunt for a medal with 400 metres to go, an exhausted Robbins threw down her oar and lay back on her teammate’s lap. Australia finished dead last and ‘Lay Down Sally’ became one of the most reviled and ridiculed figures in the nation’s sporting history. According to Rowing Australia, her personal motto is “Never surrender the dream”. There are many reasons – some sad, some sinister – that a horse might stop running midway through a race. But have you ever seen a red-hot favourite lose interest of its own volition? That is what happened at Hong Kong’s Sha Tin racecourse in June 2017 when Pakistan Star jumped late, slowed to a walk and then stopped moving altogether. Star jockey Joao Moreira was cleared of any wrongdoing or manipulation, saying afterwards that the three-year-old gelding would not respond to his commands. It was a huge and costly shock for the punters who had backed Pakistan Star in as short as -500 to win the race. Somehow, this guy continues to divide opinion in the cricket community. While some in his homeland still recall the golden child who led South Africa’s revival on the international stage, the rest of the world remembers Hansie Cronje as a cheat, a scoundrel and a pious hypocrite who fixed matches for money. One of his most blatant attempts to manipulate results occurred during England’s tour of SA in 2000. In a heavily rain-affected match, Cronje followed his bookie’s orders by declaring at 8/248 and forfeiting the entire second innings in order to force a result on day five. England chased down the runs required as tabloid hacks and well-respected commentators worldwide lauded the South African skipper’s sporting, magnanimous gesture. Writing for The Daily Telegraph, Mark Nicholas went so far as to say it heralded a “golden age” in Test cricket. Everything was thrown into stark relief a few months later when Cronje confessed his crimes and was banned from the sport for life.